CBD Life UK has become a pretty major player for those looking for CBD oil for sale online, UK residents included. In fact, this company is one of the few that operates exclusively in the United Kingdom (although they do ship internationally). 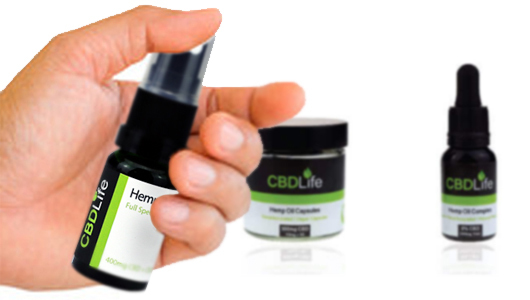 Compared to UK standards in the industry, CBD Life UK actually sells a pretty full range of products, all of which are derived from low-THC hemp and do not get you high. If you’ve spent any amount of time trying to find good CBD oil for sale on the UK high streets, you’ll know that it’s not easy coming across a well-made, effective product. Among other things, the brand offers CBD oil, capsules/pills, pastes, CBD vapes and dabs, and even CBD edibles which is a relative rarity for those looking for CBD oil for sale in the UK. Who Is CBD Life UK? Unfortunately, we had a good deal of difficulty finding out much of interest about CBD Life UK. They (obviously) offer plenty of information about their product range, but we had trouble coming to terms with where exactly the brand operates its extraction facility, and where they source their hemp plants from. We did learn that the firm uses CO2 extraction techniques, which is a plus as this is the safest and most advanced technique in the industry. However, the fact that they don’t elaborate on where the manufacturing facility is and where the plants come from is a little unsettling. It was great to learn, however, that CBD Life UK was one of the founding members of the Cannabis Trades Association (CTA), which is essentially an organization dedicated improving the transparency of the hemp industry, and ensuring that safe, quality hemp is imported into the United Kingdom. Our general consensus after doing our CBD Life UK review is that this is a good, reliable, high-quality company, but we think they greatly need to improve the information on their website so as to make it a little easier to find out who they are as a firm. As we said, we are of the opinion that CBD Life UK offers reliable, well-made CBD products for sale in the UK, even though their website and marketing may (in our opinion) leave a little to be desired). Founding member of the CTA. The UK CTA (Cannabis Trades Association) aims to ensure that only quality hemp and cannabis products are available legally in the United Kingdom, and the fact that CBD Life UK is one of the seven founding members of the organization tells us the company knows the industry inside and out, and also only offers safe, effective, and reliable products. Uses CO2 extraction. Solvent-free CO2 extraction is esteemed to be the best contemporary method of extracting CBD oil from raw hemp plants, and we learned during our CBD Life UK review that the firm utilizes only the most reliable form of CO2 extraction currently available. Offer quality CBD oil vapes. CBD Life UK is in fact one of only a handful of firms that is able to offer online CBD vape oil for sale in the UK, and in our opinion the e-liquids are safe, effective, and very well-made. Wide range of products. Again, a lot of companies who offer CBD for sale in the UK only offer the standard oral drops, but CBD Life UK offers a full-range selection including pills/capsules, vape liquids, dabs, pastes, and even CBD edibles. Affordable prices and fast, global shipping. Along with other companies like Pure Kana, CBD Life UK is one of the few firms we know of that actually offers worldwide shipping. For those who do buy CBD oil, UK residents will receive the fastest shipping, but it is good to know that the products are available for shipment to many other countries across the EU (and the world) as well. As we mentioned in the intro, it was a little frustrating that our CBD Like UK review was relatively fruitless in terms of finding a lot out about the firm. We did learn that they are based in London and are affiliated with Vape Life LTD (which is a CBD vape oil UK manufacturer), but it is still unclear where they grow/obtain their raw hemp plants from, and where the CBD extraction actually takes place. Also, while it says on their website that CBD Life UK is “not afraid of any third-party testing,” it did not (at least to our knowledge) specifically say that their products were in fact tested in an independent laboratory. This is very important as it’s crucial that all CBD products be third-party lab verified to ensure purity and CBD content. A little over-the-top in our opinion, and doesn’t exactly leave customers with a great deal of confidence that they are buying an effective, well-made product. Since CBD Life UK ships globally, we were actually able to order and try several of their products. We didn’t try the CBD paste, dabs, or the topical CBD lotion, but we were able to review the standard (oral) CBD oil, the CBD capsules, and the CBD vape e-liquid. In our opinion, the oral CBD oil (we tried the 1,000 mg) was well-made and effective, but it did not compare to other CBD oil UK products like our tried-and-true favorite Provacan CBD, which is made from the same company (CiiTECH) that helps conduct world-class cannabis research. The same goes for the CBD vape oil; it tastes good, is effective, and represents a very good value compared to other CBD vape oil UK products, but it’s certainly not the best or most powerful on the market, at least in our opinion. And lastly, the CBD capsules were more or less equally-performing as the oral CBD oil, which makes sense considering that they contain a single 25 mg serving of CBD (per capsule), while 20 drops of the oil tincture contains 20 mg CBD. All in all, our favorite thing about our CBD Life UK review was that the company really does offer fast and reliable shipping, and is able to not only ship to throughout the United Kingdom, but to other parts of the world as well. 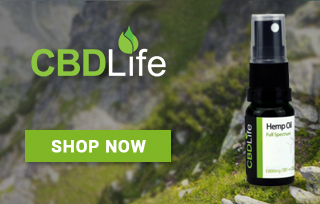 CBD Oil: The CBD Life UK CBD oil is available in either spray form or oral drops. The sublingual (under the tongue) drops are available in 400 mg (1 drop = 1 mg CBD), while the oral spray is available in either 400 mg (1 spray = 5 mg CBD) or 1,000 mg (1 spray = 12.5 mg CBD). Also, the drops are water soluble, meaning you can simply add them to a drink for increased ease-of-use. CBD Pills / Capsules: Capsules/pills contain 25 mg of CBD each, are easy to take, and are available in bottles of either 10 or 30. CBD Paste: The CBD paste is kind of like an ultra-potent single serving CBD shot, which comes in a pre-packaged plastic syringe. Each syringe contains a massive 850 mg serving of cannabinoids, and they come in single packs, packs of three, or packs of five. CBD Topical Cream: CBD cream is used for topical application, meaning you simply massage it into skin or joint areas (whatever the site of discomfort is). It comes in a 30mL tub and contains 100 mg of CBD. CBD Vape / Dabs: The vape oils come in an array of different potencies and packages, including 100 and 200 mg CBD vape pens (available in packs of one or three), as well as 100 and 200 mg replaceable vape cartridges (available in packs of one or three). CBD Life UK is one of the only companies in the UK (along with Hemp Botanics) that offers potent CBD dabs, which are available in small 1g tubs of wax/crumble and infused CBD crystal (isolate). CBD Gummy Edibles: The CBD Life UK edible CBD gummies for sale come in packs of 5, 15, or 25, and contain a fairly potent 25 mg of CBD each. Great for taking to work or school (the firm recommends one or two per day). All in all, our CBD Life UK review led us to the conclusion that we would recommend this brand on two fronts: 1) for those who are looking for a quality, reliable, and affordable CBD for sale in the UK; and 2) for those who want fast global shipping to not only the United Kingdom, but to other parts of the world as well. We love the fact that CBD Life UK is one of the founding members of the all-important Cannabis Trades Association, but we are still of the opinion that there are better, more potent, and higher-quality CBD oils out there that are sourced from better cannabis/hemp plants. If price and overall convenience is important to you, then CBD Life UK would probably be a great way to go. If quality and effectiveness is of the utmost concern to you however, we would personally recommend a more reputable brand like Provacan or Pure Kana. I trust buying from CBD Life because i know they use a solvent free, CO2 exraction method for all their products - making their oil one of the best on the market. 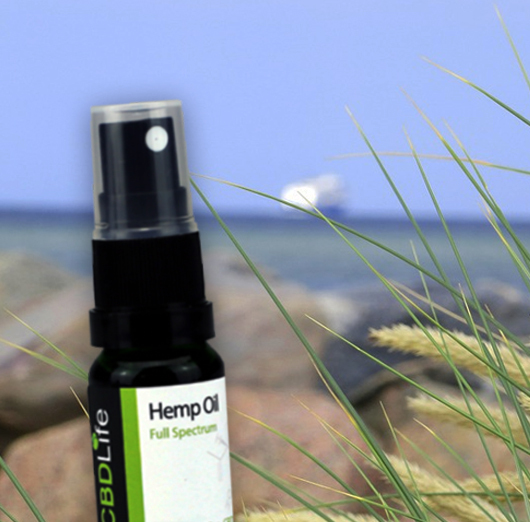 I’ve really noticed a different between CBD Life’s full spectrum oil than other non-full spectrum oils I have tried – wont be going back to my old ways! After beginning to feel over-whelmed on a daily basis at work, I’ve found that these CBD capsules really help with my stress levels. ‘Reclaim your life with CBD Life’ – never has a saying been more true. I've been able to eliminate all the mental stress in my life thanks to the CBD Life Hemp Oil Capsules. I drink a lot of water during the day, so the CBD Aqua Drops are a hassle-free for me to get my daily CBD. Alexandra from Ashburn just bough! Daphne from Ashburn just bough!